I just heard one of the local Sioux Falls 10pm anchors say, “she recommends you take a multivitamin and maybe go tanning”. The statement rounded out a report about a growing number of people experiencing depression due to the seemingly never-ending winter here. Tanning. Extreme measures apparently for extreme situations. That’s not really something you hear people recommend anymore. I’m not sure that in 6 years of school in Madison, Wisconsin .. we’ve had as many snow days as we’ve had in 3 months of school in South Dakota. The house has been bustling it seems, at least a couple days each week this ‘spring’, with our 11 y.o. home from school. Snowbound. There have been countless late starts. Early releases. Days of no school at all. Today was another early release. And while the snow had only been falling a couple of hours .. by the time school had gotten out, the normal trip in to bring her home took 3x as long as usual. I cancelled some afternoon business meetings I had really wanted to get to as a result. I just didn’t want to risk it. Again. One of the more heavily traveled roads in and out of town ..
Country roads here are a different beast than they are, back in the Badger State and the Prius has been a champ of a car so far. While I adore the gas mileage and it’s been a great vehicle for us, I desperately need 4 wheel drive. Why? Because everyone else has them and I’m the little (wo)man out there fighting the good fight, it seems. Everyone’s always waiting on me to stop holding up traffic. Passing. Splashing. Waiting for me to hit the ditch so that they can pass. Well, they’re not that crass. But you get the idea. Either that or I need chains for my tires. When snow falls here, it doesn’t fall. It blows. Sideways. And where there aren’t massive random drifts, the snow sticks on the roads really, only when vehicles drive over it. Creating an unbelievable icy mess even the plows seem to have a tough time clearing and getting out in front of. So everything instead, shuts down. Schools. Businesses. Highways. This past month snowstorms have closed the Interstates here north to south and east to west pretty much across the entire state on multiple occasions. And kept us home more than I’d ever imagined. Hard to believe. The Cowboy worries it’s just hard for me to be home so much. A big switch from having a job that had me going into work to report the news regardless of the weather – getting into the anchor desk however I had to get there. Now, being a product of the news and bunkering down at home to ride what has been at least one major storm a week. Short of getting a little restless, and having my own work from home days disrupted by a house full of family that was supposed to be elsewhere for the entire day .. it’s been strangely entertaining and a bit refreshing to have everyone around and just spend some down time together with nowhere else to go. In part, because we can’t. Speaking of refreshing .. this snow shouldn’t stick around long. And hoping it’s the last we see of it this spring. Temps are supposed to be in the 70’s by the weekend. 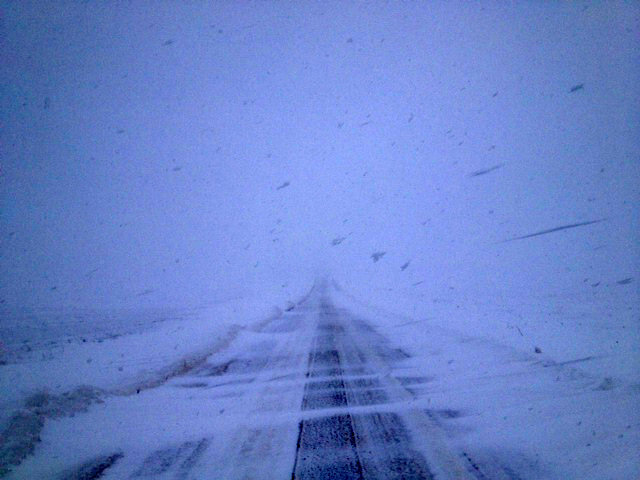 This entry was posted in Cowboy, Lifestyle, Ranch Life, Rural South Dakota, Snow Days, South Dakota, Wisconsin and tagged Backroads, Rural Roads, Snow days, South Dakota, Winter travel, Winter weather, Work from home by Carleen Wild. Bookmark the permalink. You remind me of the fact that we don’t have it so bad back here in America’s Dairyland! I hope things are clearing up for you today. So far Spring in the lower counties of Wisconsin has been pretty easy although the Spring feeling is slow on arriving – not enough sun and warmth but this weekend wil help here too. Hope all the bugs of summer have you forgetting how long, cold and drawn out this past spring was!